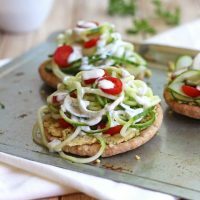 Chickpea Cucumber Mini Pita Pizzas. A light and refreshing summer meal of toasted mini pitas, chickpeas, spiraled veggies and a tangy yogurt sauce. 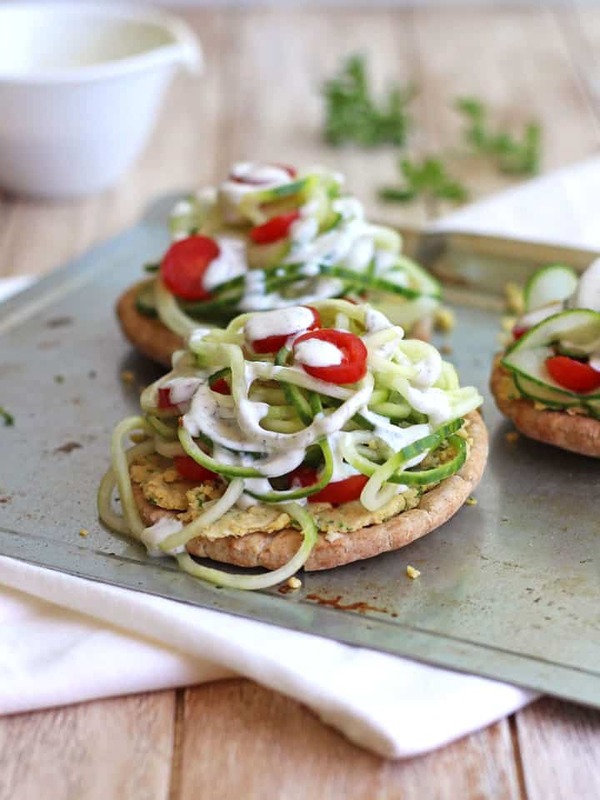 This fresh, filling, crunchy, creamy recipe for Chickpea Cucumber Mini Pita Pizzas is brought to you courtesy of a second chance and the ability to change. I love beans, kidney beans are my favorite but I will top a dish with any available legume. Sadly, I married a wonderful man who most certainly was not a bean fan. Unless they were on top of nachos or hidden in a bowl of chili he wanted no part of them. At the start of our healthy eating adventure my husband Tim became interested in weight training. As with any new pursuit he started learning a lot about it, specifically the part protein plays in muscle development. One night we watched a documentary on body building. It included some very muscular vegetarian and vegan body builders. I think that movie sold the idea of eating plant based protein better than I ever had. Off-Topic – I’m convinced you can find a documentary on any hobby or interest. Last week we watched one on a single typeface! That’s right a whole movie about a solitary font and it was actually interesting. Back to the beans: Over time there were no more silent protests of uneaten kidney beans at the bottom of salad bowls. And Lima beans stopped being creatively spread around empty plates. Curious one night I asked him about this new found bean enjoyment. I was surprised when he said he liked their high protein but was a bigger fan of their taste and texture. Confused, I asked what had changed. He said he couldn’t really remember why he disliked beans so much he just always said he didn’t. And after considering their nutritional benefits he thought it might be worth giving them another chance. 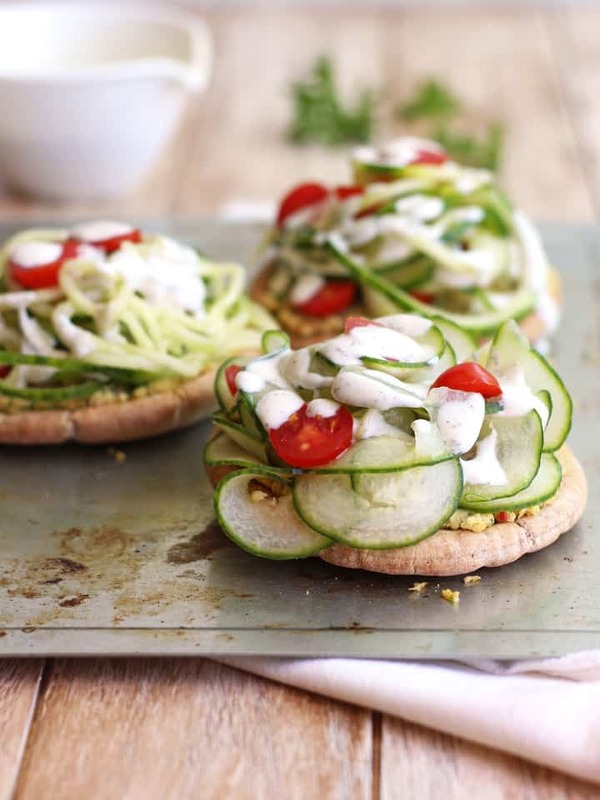 It didn’t hurt that we had started eating seriously yummy bean-filled meals like Mango Sriracha Potato Veggie Bowls, Spicy Chickpea Edamame Salad Pitas, Baked Egg Tostadas, Sweet and Savory Baked Sweet Potatoes and these fresh Chickpea Cucumber Mini Pita Pizzas. The point of this post (outside of a very yummy recipe) is not to tell you to eat something if you hate it. It’s just a recognition that changing is hard, requires thought and second chances are underrated even for beans. Being open to questioning long held food or exercise phobias can make creating a healthy diet fun and exciting. A fun and filling easy meatless meal for two that's piled high with fresh veggies. Preheat toaster oven to 425 F. Lightly rub olive oil on bottoms of pita pockets. Place pitas oiled side up on a cookie sheet and bake for 5 to 6 minutes until lightly browned and crispy. While pitas cook prepare the yogurt sauce. In a small bowl whisk together yogurt, sea salt, pepper, dill weed and olive oil. Whisk in lemon juice a tablespoon at a time until desired consistency is achieved. Season with more salt and pepper to taste. 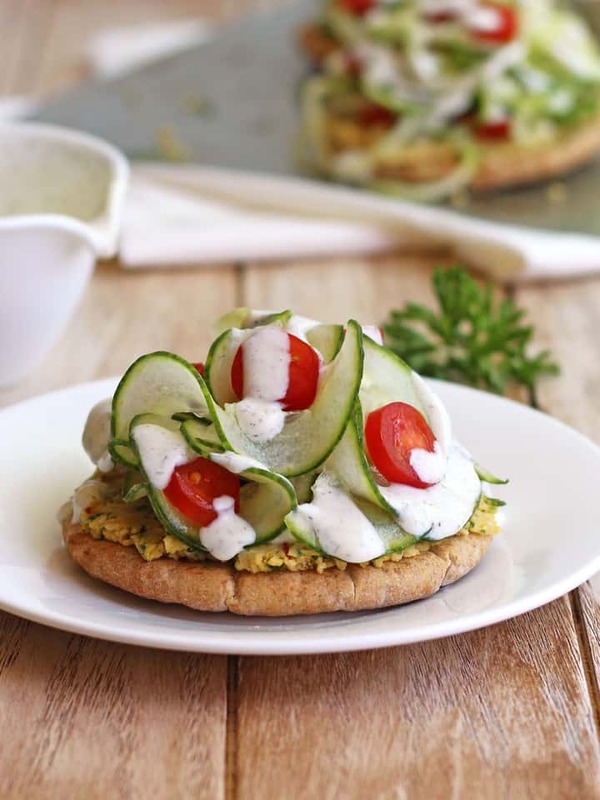 Spread chickpea mixture onto each pita, top with cucumbers and sliced tomatoes. Drizzle with yogurt sauce and enjoy. Pizzas can be made using 2 full size pitas instead of 4 mini pitas. Nutritional Information is an estimate for 2 Mini Pizzas. This recipe was submitted to the Meat Free Mondays challenge at the yummy vegetarian blog Tinned Tomatoes – check it out every Monday to easily plan a delicious meat free week! Being a vegetarian, my family is always suspicious of something “healthy” I might try on them. Even redesigning a vegetable into a cool topping such as this, they would be sure I’ve imported something yucky from Mars. LOL . . . I love the idea and would like to try it for church dinners. I think I’d like to cut the pitas into smaller pieces as an appetizer. Think that would work? I totally think you could cut the pitas into smaller pieces! They might fall apart a little if you wait until they are fully assembled to slice them. Instead, after topping the pitas with the chickpea mixture I would use a pizza cutter to cut them into smaller pieces. Then I’d top the little bites with the veggies. If you have a chance to make them I’d love to hear how the smaller ones turn out. I really want to pick one of those up and dive in. Great ingredients and such gorgeous photos. I was excited to see you had added them to the Meat Free Mondays linky. Unfortunately you didn’t link to the challenge, so I wasn’t able to feature you. Remember to link up, I think my readers would love your recipes. Hi Jacqueline, thanks for the kind words and the heads up about the link up. You were the first one I have submitted to and I’m still learning the lingo. I get what you are saying now and appreciate the help.